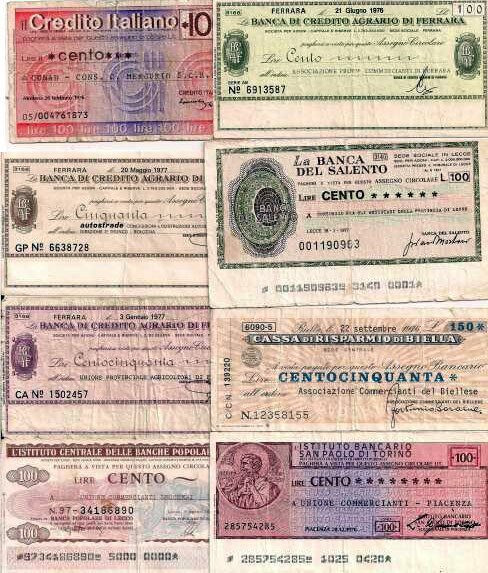 Italian "mini-checks" ("assegnini"). For some reason, in the second half of the 1970s, the Italian state mint was unable to produce enough coins for the needs of the economy. As a result, coins were replaced for a few years by these "mini-checks", released by private banks. The result was that the Italian economy in this period is perhaps the only modern example of an economy running without metal coins. There is a question that has been nagging me for years: why do we keep in our pockets both paper money (banknotes or bills) and metallic coins? It wouldn't be difficult to write higher numbers on coins just a little bit larger than the ones we use today. In Europe, the largest coin is worth 2 Euros, but what would prevent the mint to make coins worth 10, 20 or even 100 Euros? In any case, the metal of the coins is worth very little in comparison to the face value. On the other hand, why do we need coins at all? Why can't we have pieces of paper worth just cents rather than euros or dollars? After all, the Italian economy in the 1970s ran for years almost without metal coins; all on the basis of paper money used also as small change. It took me a while to understand this point and only recently I found an explanation based on physical factors. Probably, this point is clear to economists, but, it doesn't seem to be common knowledge or, at least, I couldn't find it in the Web, so I thought I could discuss it here. Of course, I am not an economist, I am a physical chemist, but since I'll be telling about the physics of money, I think I can try. So, let me start. Starting from some 5000 before our time we see gold objects appearing in the archeological record. Jewelry, death masks and all sorts of elaborate objects show that kings and chieftains were using gold as a means to show off their power and their wealth. Soon, gold became a world recognized commodity, the objective of military raids and of commercial transactions. However, in order to see the appearance of "currency" in modern terms, we must wait for the 6th century BC, when the first coins were minted in Lydia, a region part of modern Anatolia and perhaps at the same time in China. Minting coins was a remarkable technological feat. It takes hard dies that must be able of multiple strikes on gold or silver disks, always leaving the same impression. Making these dies required sophisticated methods but, once the technology was developed, the capability of creating standard gold or silver pieces led to the global diffusion of the concept. Coins were practical: easy to transport, easily recognizable, easily exchanged. Gold coins also retained their value even at long distances from where they had been minted and could be used for international commerce. It took just a few centuries after the Lydian invention for coins to become a stable feature of the world's economy. They would maintain that place for more than two thousand years. Now, if you get into coinage, you have to take into account two basic physical factors that have to do with gold and silver. The first one is that they are scarce and expensive to produce, the second one is that they have specific mechanical properties. If you make a gold coin, you need to take into account its mechanical properties: you cannot make it too small and not even too thin. Make it very small, and it would be easily lost. Make it very thin, and it would easily bend and lose its shape. In short, you have a minimum amount of gold that you need. In practice, no ancient gold coins weighed less than about 3.5 grams ( around 0.1 oz, the weight of a Florin, minted by the Florentine Republic during the Renaissance). More commonly, a gold coin would weigh more than that. The Roman "Aureus," for instance, was a true imperial coin, weighing in at 8 grams each. Similar weights are typical of silver coins. There are records of heavier coins, but this range of weight is the most common. The second physical property of gold to be considered is its geological scarcity. That affects not the size of the coins, but their number. In practice, in ancient times it was never possible to mint enough gold or pure silver coins to put coins in the hands of everybody. Today, the above ground stock of gold is estimated to as something that goes from 150,000 tons to 170,000 tons. For a comparison, the amount of silver mined so far is estimated to be over one million tons. The world stock today correspond to 22 grams per person. It is much more difficult to estimate this amount for ancient times, but the various estimations give us at least an order of magnitude. According to Govett (1982), the gold stock per person has always remained in the range of 30-50 grams over history. The Gold money foundation estimates much smaller amounts in ancient times, even less than one gram per person although, personally, I think they are too pessimistic. So, if you have 40 grams of gold and a gold coin weighs 4 grams, your allotted stock of coins is just 10 coins. But, of course, coins were not equally distributed. The rich had hundreds or thousands, the poor had none. For the rich, gold coins were the currency of choice for large transactions. Cicero's purchase of a house on the Palatine Hill required 3.5 million sesterces which would have required a few tons of silver denarii or hundreds of kilograms of gold aurei (as described by Verboven). A hundred kg of gold in the form of 4.5 grams coins corresponds to some 20 thousand coins. Carrying out transactions with this large number of coins was surely unwieldy, but not impossible for the few who were lucky enough to have them. But there was another problem, under many respects the opposite: how to carry out small everyday transactions using high value coins? In ancient time,s it was common knowledge that a gold coin was worth approximately one ewe (curiously, that has not changed so much, even today). So you can buy ewes with gold coins and also oxen, camels and the like. If you are rich, you can buy entire estates by thousands of gold coins. But what if you want to buy something much smaller and less expensive? A loaf of bread, for instance? For this purpose, gold coins are useless. It would be as if in our world there existed only $ 100 bills and nothing smaller. The problem is similar with silver. True, silver is more abundant than gold, but not so much more. In practice, over the centuries the exchange ratio of gold to silver has oscillated around a value of 10 - that is, as a first approximation, a gold coin was worth 10 silver coins. This is better in terms of having small change available, but still not so practical. Suppose, again that you wanted to buy a loaf of bread, surely it took more than ten loaves to buy an ewe and a silver coin was still too large. The problem had to be solved in a different way. The problem of having small change for everyday monetary transactions - say, for a single loaf of bread - was solved already in very ancient times by developing what was often termed "petty money", to be seen as something apart from the "moneta grossa" ("big money") as the Italian merchants of the Renaissance would call pure gold and silver pieces. Petty money was usually an alloy of silver and copper or, sometimes, pure copper. Using an abundant metal such as copper, it could be issued in large amounts and in terms of low value coins. Petty money was not simply a question of low denomination. It was a completely different form of money. The "moneta grossa" had a value corresponding to its weight. The coin was normally just a convenient way to measure this value by counting coins rather than weighing bullion. It was what modern economists call "commodity money". Petty money, instead, was a form of "fiat money", a kind of currency that had a face value unrelated to, and normally much larger, than its value in terms of the component metals. This fundamental difference stabilized the system: two completely different kinds of currency co-existed for most of ancient times. Indeed, the two currencies had different purposes and different diffusion. Moneta grossa, pure gold or silver coins, were for the rich and were used for important or international transactions. The poor had no use for gold coins and it is likely that most of them wouldn't even see a gold coin during their lifetime. The intrinsic value of these coins made them valuable even at long distances from the places where they were minted. So, we find Roman coins that made their way up to China to buy silk. It didn't matter to the Chinese that these coins had the face of a Roman Emperor on them. They could always be fused and re-minted or the gold used for other purposes. The opposite was true for petty money. It had value only close to the place where it was minted and this value was created, normally, by the fact that the local king or warlord or chief brigand would accept these coins as payment of taxes. As the local king/warlord/chief brigand controlled the local army, that was the crucial point that guaranteed value for these objects that, otherwise, would have had no value at all. Even today, if our government were to accept squirrel skins as means of payment of taxes, then banks would be soon turned into tanneries and the old men sitting on park benches would carry with them poisoned crumbs. So, petty money was a very "modern" tool for commerce. Among its characteristics, one was that it was subjected to inflation; a characteristic that often was obtained in the mint by debasing it; that is by reducing the amounts of silver the coin contained or, sometimes, making the coin smaller. Because of this characteristic, there was little or no overlap of the two currency systems: they had different purposes. Now we are in the position to be able to understand the origin of our currency system. Simply, the coins we carry in our pockets are the descendants of the old petty money while banknotes are the descendants of gold and silver moneta grossa. We are still having two currency systems, one used to buy small items - you usually pay your coffee with a coin, but larger purchases are regulated with greenbacks or - in more recent times - using credit cards which are an evolution of paper money. Today, petty money coins are not made any more in silver/copper alloys. They tend to be made in low cost metals, sometimes gold colored brass, or steel or even aluminum. They have retained their characteristic of local currency. You can use them in the country that has issued them, but not elsewhere and, normally, banks will not change them into different currencies. Paper money used to be simply a token that indicated a certain amount of gold and silver that had to be paid to the bearer. Still today, banknotes printed by the Bank of England carry the sentence, say, "I promise to pay to the bearer on the bearer the sum of 10 pounds" which, of course, doesn't mean anything today. With time, paper money has evolved into a purely "fiat currency" and even transformed itself into "plastic money" that takes the form of credit cards. Still, this apparently worthless kind of currency retains an international aspect. Dollars are accepted everywhere and you may be surprised to learn that about two thirds of the existing $100 bills are to be found somewhere outside the US. Also, we shouldn't be surprised about the existence of multiple monetary standards. Human creativity is such that anything can be used as a medium of exchange provided that it is sufficiently rare and difficult or impossible to over-produce: works of art, antiques, real estate and more. Humans and money are strictly linked to each other, but it is a complex relation that has been going on for many century and it changes all the time. Will gold coins return, one day? Who knows?